It is a tradition in Angus's family especially the guys to go hunting every year. Usually it is held in middle of November in the Adirondacks, in New York state. Gus doesn't hunt, but he still goes every year to hang out with his family. The camp was built by uncle Josh in ... "no idea!" Gus said. A week ago Gus and Benny went to the camp for a work weekend. They left on Friday morning and stayed there for two and half days. That was when I called 911 because I was nervous of being alone at my house (old post: 911). 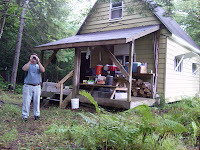 Gus's job was to bring food; he made beef stew, marinated steaks, brought some bread, snacks, and beverages. 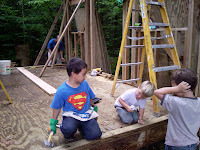 They were building an addition to the camp. 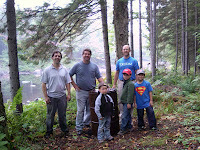 The other guys were: Steve (hunting buddy from Skaneateles), our cousin Alex's husband, Steve, and his two sons, Will and Nat; and cousin Jace, who was the team leader. 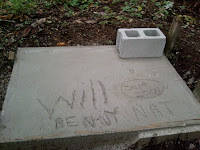 Benny was very excited to be there, because he had two friends to play with. When they got home from camp on Sunday, it was in the middle of the night. Gus and Benny were very dirty and they had a lot of dirty and wet laundry... ayayay! Benny was very tired and half sleeping when I helped him take a bath.